Thousands of Indonesians thronged their embassy in Singapore to cast their votes for a new president and Parliament yesterday ahead of Wednesday's main polls back home. They were among two million overseas voters who had until yesterday to pick between incumbent President Joko Widodo, who is seeking a second term, and former army general Prabowo Subianto. The two men also went head to head in the 2014 presidential race, with Mr Joko prevailing with 53.15 per cent of the votes. This year's poll is the country's first simultaneous presidential and legislative elections, so overseas voters also had to cast ballots for members of the House of Representatives (DPR). The early birds yesterday included bank executive Lany Widjaja, 62, resplendent in a fiery red batik dress. She said: "I am very excited. This election is important for Indonesia's future. I will choose the president who I think will do great things for Indonesia." The embassy said there are 127,000 eligible voters in Singapore, with about 18,000 voting by post, while the rest came in person. At least 38,000 people had voted here yesterday. The diverse crowd ranged from businessmen and professionals to domestic helpers and students. They were in high spirits as they queued patiently at the embassy in Chatsworth Road from as early as 6am - two hours before the polls opened. Even the sick would not miss it. Christian priest Bigman Sirait, 58, who was recuperating after an operation to fit a mechanical heart pump last month, came in an ambulance with a tube in his nose. He was all smiles after punching a hole in the ballot papers and dipping his pinkie in indelible ink. "I may be sick but I will fight this battle. If I don't exercise my right and stand to be counted, I am a coward," he said. Indonesia's Ambassador to Singapore, Mr I Gede Ngurah Swajaya, said: "I'm deeply touched by the enthusiasm of the people. We see a lot of old people coming, and people who are handicapped." Mr Ngurah also played usher for the day, directing voters to around 50 polling stations set up on the sprawling embassy grounds. "Have you voted yet?" he hollered. "Yes! For democracy! For Indonesia!" chorused a group of women, raising their ink-stained fingers in the air. Voters had travelled by car and taxi, as well as shuttle buses provided by the embassy from Redhill, Geylang Serai and Orchard Road. 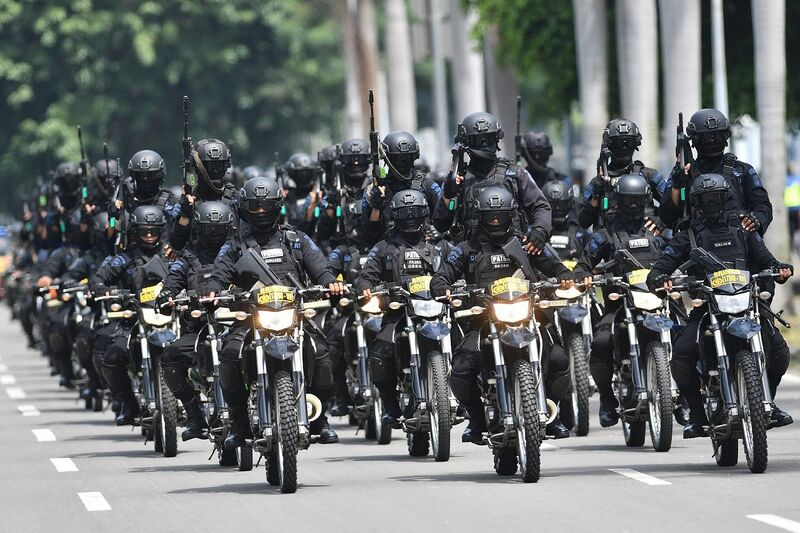 •The Indonesian armed forces (TNI) and national police yesterday conducted a joint ceremonial roll call in Jakarta as part of preparations to ensure a peaceful election on Wednesday. • More than 593,000 police and military personnel have been mobilised for the upcoming polls, which could involve as many as 192.8 million voters casting their ballots at 800,000 polling stations across Indonesia. •Jakarta's police chief, Inspector-General Gatot Pramono, yesterday appealed to the public to stay calm amid the heat of the legislative and presidential race. "We call on all parts of society, including the media, to stay cool," he added. •Officials, workers and volunteers on Saturday night rushed to remove election-related banners, posters and other party paraphernalia that were put up during the seven-month campaign period. In addition to a ban on campaign activities during the mandatory "quiet period" from yesterday until Polling Day, political parties also cannot publicly display their party colours. • President Joko Widodo and First Lady Iriana yesterday arrived in Saudi Arabia to perform the umrah, the minor Muslim pilgrimage to Mecca. Istana official Bey Machmudin said in a statement that the President, better known by his nickname Jokowi, will be meeting King Salman and Saudi Crown Prince Mohammed bin Salman in Riyadh, before returning to Jakarta today. Domestic helper Suparmi, 34, who was driven by her employer, said: "I am here to vote for a president with a heart for the common people. My boss is supportive and does not want me to miss it too." Former president Susilo Bambang Yudhoyono stole the limelight when he turned up in the evening, drawing squeals and handshakes. Mr Yudhoyono was in Singapore to care for his wife, Mrs Ani Yudhoyono, who was undergoing blood cancer treatment at the National University Hospital. "Ibu Ani was in high spirits to recover," he said. Voting in Singapore for the first time was a "new experience", he said, adding: "Here, I could see the spirit of Indonesian people is good and I'm happy as a former leader. Hopefully it will bring good things for our country." Mr Ngurah said measures were in place here to protect ballot papers, adding: "This is a very secure location - we have 24/7 CCTV monitoring, we have our national police." Ballots will be manually counted at the embassy on Wednesday, witnessed by volunteers who support the two presidential candidates as well as Indonesian election supervisory agency officials. Overseas voting has been marred by claims of rigging. Thousands of ballot papers suspected to have been illegally marked in favour of Mr Joko had been discovered in Selangor, Malaysia, by Indonesia's General Elections Commission last Friday. Voting in Malaysia went ahead as scheduled yesterday.